Eating snails doesnt have to be a treat unique only to the French or people at high class dinner parties. You too can feast on escargot. 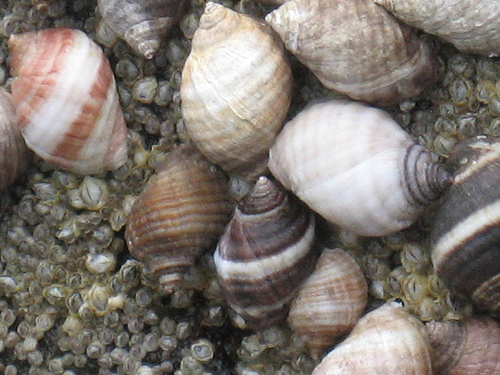 The Common or Edible Periwinkle (Littorina littorea, and L. littoralis), the Smooth Periwinkle ( L. obtusata), Gulf Periwinkle (L. Irrorata) and the Southern Periwinkle (L. Angulifera) are sea snails found in great quantities in the maritime states of New England, off the coast of Eastern Canada and down through Florida and the Gulf of Mexico. At low tide you can find more of these snails clinging to the rocks than you can ever hope to make use of. Eating Periwinkles has never been popular in this country, though in Europe and particularly in England, they are fairly common fare to this day. In the 19th century, "Winkle" shops sold them for 2 cents a pound and they were considered common food for common people. Just as the eating of land snails (Escargot) never became culturally accepted here, marine snails just didnt seem to catch on. According to Euell Gibbons, the Edible Periwinkle was not found in this country until around 1850 when it suddenly appeared off the coast of New Brunswick and Nova Scotia, Canada. Prior to that time, the only maritime varieties of Periwinkle were too small to be of economic importance. In the last 140 years, the Edible Periwinkle has migrated down the East Coast as far as New Jersey and possibly further South. On a trip to Boston last summer I decided to forage the coastline along the northern portion of Cape Cod in search of Periwinkles, Sea Urchins, and edible Seaweeds. While gathering and sampling some very mild and tasty seaweed known as Laver, I rounded the end of a manmade rock wharf and began looking around the side exposed to the main current of the ocean. To my surprise, I saw the rocks were literally swarming with masses of dark Periwinkles. Seaweeds were temporally forgotten, and I greedily began filling a bag full of the snails. Finally, a gallon later I realized that I had more Periwinkles than I needed to make a wonderful mock clam chowder. Its easy for your eyes to be bigger than your stomach when faced with such an abundance of free and plentiful seafood. Edible Periwinkle is very easy to identify as it is the largest of all members of the Periwinkle family. It is usually a drab olive color though it can range from brownish-yellow to gray to black. It has a whorled (spiraled) shell and grows up to 2.5 cm (1 inch) in size. In New England it can be found by the thousands clinging to rocks and seaweed at low tide. The cold water and drastic tidal variations seem to be just what it prefers. In the same area, the slightly smaller L. littoralis can also be found in great quantities. The other major species of Periwinkle is the Lined, Marsh or Southern Periwinkle. Originally found only around Florida and the Gulf of Mexico, it too has been steadily migrating and can	now be found as far north as Massachusetts. I saw a few of this variety at Cape Cod but not in the same great quantities as its northern cousin. 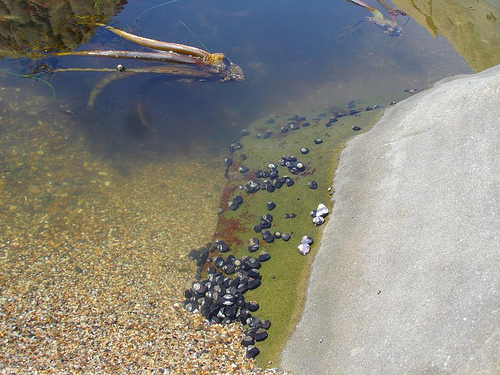 The Gulf & Smooth Periwinkles are common along the East Coast, down through Florida and the Gulf of Mexico. These, along with the somewhat similar looking Swamp Snails can be gathered and eaten. Southern Periwinkles are about the same size as the Edible Periwinkle but are a whitish-yellow in color and have a line of small brown spots on the whorls. Another Southern Periwinkle I found in the Gulf and in Mobile Bay was slightly smaller in size and had the same small brown spots on the shell. The Southern Periwinkle and this smaller brown variety can be found in equally large amounts in protected salt marshes clinging to plant stems and decaying vegetation floating on the surface. 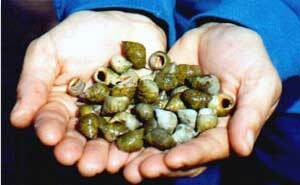 All Periwinkles are edible though many are simply too small to be worth the effort to free them from their shells. In an emergency, however, you can feel safe in eating any of them without fear of poisoning yourself as with some other varieties of shellfish. It isnt necessary to remember which months end in an "R."
PeriwinklesWhen I finally did make it back to Alabama, I simply replaced Clams with Periwinkles and had a chowder which was indistinguishable from the real thing. I personally can tell no difference in taste between them and most other types of shellfish. Periwinkles can be processed just like land snails to free the meat from the shells. 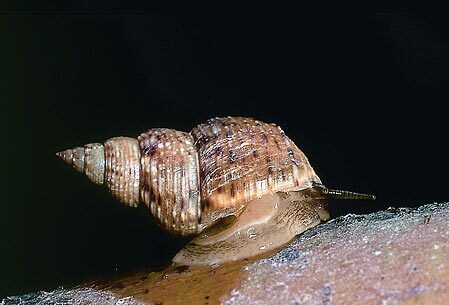 One thing to remember is that all snails have a hard operculum on the end of their feet with which they seal their shell, protecting them from enemies and preventing them from drying out. You need to remove these prior to eating them if you dont want a crunchy meal. 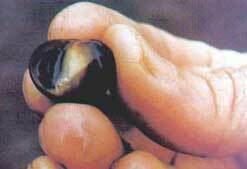 To cook Periwinkles, first take a sauce pan full of water and throw in a small amount of salt. Bring to a boil and toss in the snails. Let them simmer for a few minutes, remove and use a toothpick to pull the meat from the shells. The salt water serves to both shrink and toughen the meat, making it easier to remove. Dont boil them too long or you will end up with a very tough and chewy meal. PeriwinkleI like to take the snail meat and saute it in some butter and garlic, eating it like Escargot. You can also use it as a substitute in any shellfish dish. One of my favorite recipes next to Periwinkle chowder is to make Periwinkle Fritters. This recipe comes from Euell Gibbons excellent book, Stalking The Wild Asparagus, and I can definitely state that it makes a good meal. Mix all of the ingredients together to make a moist stiff batter. You may have to use a little water or milk to make it moist enough. Drop them by the spoonful into a hot, greased skillet and fry until golden brown. Serve with Cocktail sauce and enjoy. This makes an enjoyable and very filling meal. When foraging for Periwinkles, dont miss the opportunity to gather other edible sea-side plants and animals. The coastal regions of the United States and Canada provide the forager with an abundance of plants, animals, mollusks and seaweeds. There is no reason to go hungry in the midst of such abundance.